Sautter of Mount Street | How Many is Too Many? Sautter of Mount Street / Blog / How Many is Too Many? Is it really a collection? If it were wine, it would be a ‘cellar’. If it were books, a library. A collection of cigars then, is perhaps a humidor – or more romantically, perhaps a Keep, Vault or Cave? Whatever you call it, your stash is the total amount of cigars you have dotted around the place. This may be in a locker at a favoured cigar store; in a homemade plastic humidor; in a fancy-schmancy wooden marquetry box or even in one of Sautter’s to-die-for humitrunks. However you keep your beloved sticks, this is your inventory. Is it a collection laid down for investment purposes or is it more simply a ‘store’ of cigars that you intend to smoke? Perhaps, like many, it’s a mixture of both. Cigar newbies are warned by ‘old hands’ about the perils of ‘collectivitis.’ They start with a tube or two, then decide on a desktop humidor so they can keep a decent selection for those precious moments when they decide to smoke a cigar. So now a ‘proper’ humidor is required; something that will store a few boxes. Decent cigar humidors aren’t cheap. And you can spend almost anything you like on grand designs and beautiful veneers. Many opt to make a home-made version and then get hung up on keeping the temperature and humidity just so. This cigar craziness makes the rest of us old hands laugh; been there, done that, bought the T-shirt. And so it goes on – the larger humidor soon fills and the need to store multiple boxes for ageing, investment and basic overspill become paramount. Some, of course, take this to a Premier League level. Some collectors in the Far East have their own storage warehouses, where vintage, rare and aged specimens sleep in perfectly computer-controlled conditions. Most of us, on the other hand, have to rein things in a little. We wouldn’t go quite that big, even if we could afford to. Which we can’t. 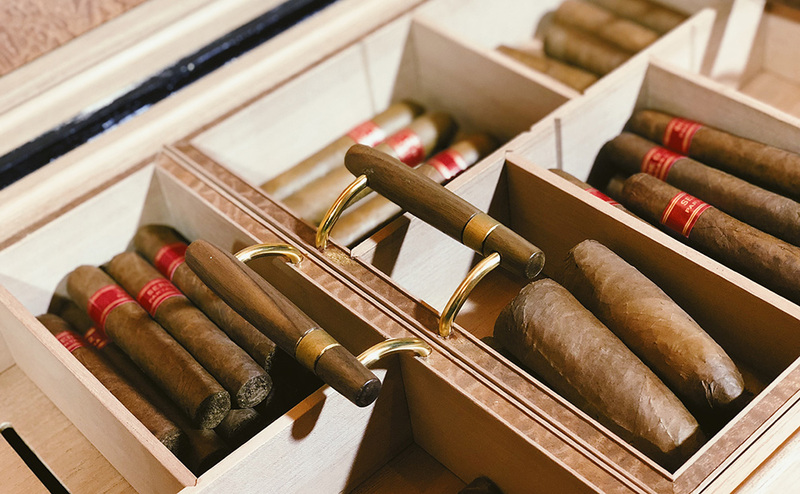 There are bills to consider; wives to negotiate; children to feed and countless other reasons why your cigar collection can’t become your major monthly expenditure. The key is to reach a happy medium for all concerned. If you had embarked on building a wine cellar, you wouldn’t call it a day after filling your kitchen wine rack with gluggable samples. You’d likely be hoping to build something a little more substantial and would probably have at least one eye on keeping some bottles for the potential uplift in their value. The same is true of cigars, but this development of brands, sizes, ages and flavours is not something to be done without due care and attention. We strongly advise a good consultation with a cigar specialist. You’ll make less expensive mistakes in the long run. Come and talk to Sautter. Perhaps look into the option of securing the services of the Cigar Butler; you’ll receive no better advice in the world of cigars.